When I was a boy of about nine, I went out to fly a kite on the banks of the Mississippi River. I was living in little New Madrid, Missouri, a town known for an earthquake two centuries ago that reversed the flow of this mighty river. The Tennessee/Kentucky border sat just across the river from me, but ever since I’d seen a boy dive into this water and never resurface, I had a deep respect for just how far that was. I flew my kite in the same winds responsible for the violent current, and they did not disappoint. I watched and maneuvered as the air pulled it higher and further over the river. With every tug I felt in my hand, I released more string, and what I released, it took. Every extra inch I gave was an inch it grew until I had nothing left to offer. 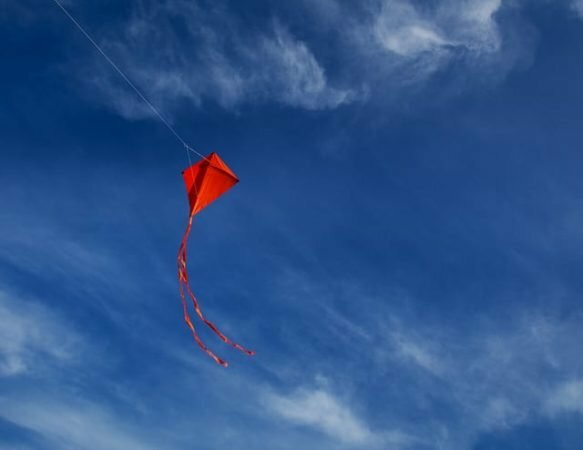 Still at its apex, the kite pulled at all the string I had and my hands, firmly clasped around the wooden spool, tried to control it without pulling it out of the sky completely. But once I’d gotten the hang of flying a kite with the string fully unraveled, I got restless again. I was out of height to offer, but the kite wasn’t out of height to gain. I could continue to let it fly only while I was holding it, and eventually draw it out of the sky back to where it started. Or … I could let go and watch it pursue new height without me and ultimately end up somewhere else – somewhere I could not get to it – somewhere along the Tennessee/Kentucky border. Being nine, I was still more in awe of the elements than afraid of them, so the next time I felt a pull, I let the kite go. I watched it take all the air that my hold on the string had kept from it. Without my guiding hand, it tumbled and fluttered, sputtered and dipped. But it stayed in the sky – stayed above water. I watched transfixed as the kite that used to be mine easily cleared the mighty Mississippi. And I stayed on the Missouri banks until I’d seen it glide slowly down to rest on the grounds of a different state, though which state I couldn’t quite tell. Sometimes I’d go back to that spot to see if someone across the way had discovered the kite and helped it into the sky, but it never found its way back to me. Fifty years later, I drove my 18-year-old daughter to the airport. She was headed to college 1047 miles away. I had taught her, among other things, all the states and their capitols, the order of the U.S. Presidents, four chords on the guitar, how to ride a bike, and what a free safety does on a football team. And I was out of string. Two years later, I would make the same drive with her sister, and stand firmly on the Missouri ground while my younger daughter flew to another state to look for apartments, earn internships, run marathons, and mentor other students. I could not have done those things for her, I could not even have guided her subtly through them – I could only release her and free her to pursue them. It is a terrifying thing to let something that once belonged to you belong to itself instead … to test the integrity of what you’ve made against the winds and above a violent, dominating current. But as far as you can lead someone is not as far as they can go. It is the tragedy and triumph of creating something capable. But kites were made to fly, not merely to be flown. written and illustrated by his wife, Becky Blades. He and Becky live in Kansas City, Missouri.